As you can tell from reading the track list, this CD consists of two monster tracks. But these track-lengths are not that unusual for Fela compositions. And many albums feature songs that last twenty or more minutes. In fact, during live performances, some songs were extended over an hour. 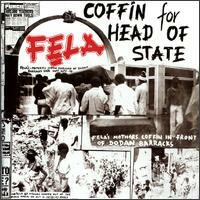 Anyway, at this point Fela's home in Nigeria had been attacked, and burned by government forces. Fela, most of his musicians, and several neighbors were severely beaten. His mother was even thrown out of a second floor window, and eventually died from her injuries. And as a result, the music, at least for the next couple of years, became much more subdued, somber, and angry. Unfortunately, his state-of-the-art recording studio, along with many master tapes, were also destroyed during the attack. So the sound-quality of this release suffers from lower quality compared to earlier albums. And althougth there is some great music on this album, some of the magic of earlier releases is also lost. The jamming is fairly interesting, but Coffin For The Head Of State doesn't offer anything new. The formula is basically the same, yet stripped of several layers. I recommend buying this CD after checking out earlier albums.